Kapa'a, Wailua, Na Pali, Allerton Gardens, Lihue, Waimea Canyon, and more! 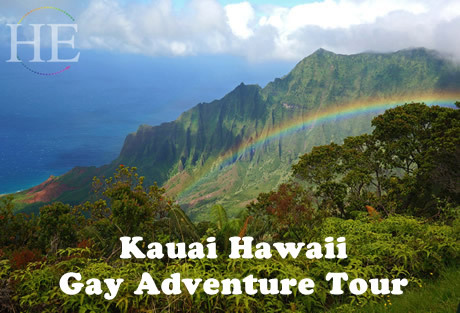 From the lush valleys of the Na Pali Coast, to the top of Waimea Canyon, our gay Kauai multi-sport adventure will put you in the water, onto ATV's, and under waterfalls in a prehistoric jungle. 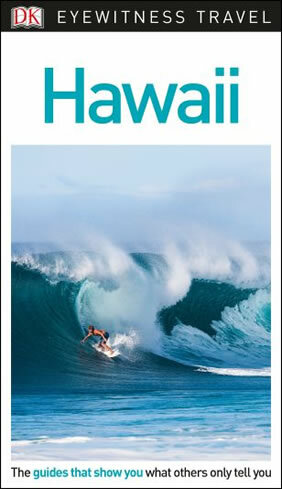 Enjoy ocean-view rooms, exquisite food & hospitality as we explore the "Garden Island" of Hawaii. 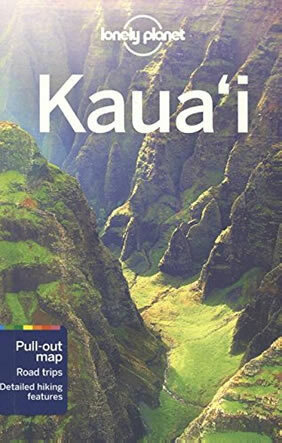 Join us on this gay Kauai multi-sport adventure, and let the oxygen-rich air of Kauai stimulate you as you hike the NaPali Coast, famous for its sheer cliffs, rising above crashing breakers. Sail to the forbidden island and peer into its hidden mysteries. Fly above the island in the cab of a helicopter, hovering inside the cone of an extinct volcano. 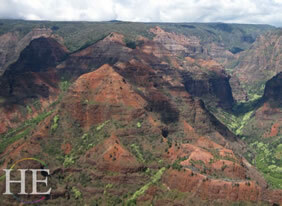 Breathe deeply as you gaze off the edge of Waimea Canyon, the Grand Canyon of the Pacific. 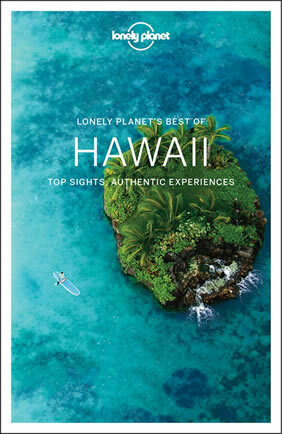 Let Kauai speak to your soul: without words, but with the drumbeat of a thousand generations. On Kauai, you'll hear the waterfalls call to you, as they tell the legends of the Hawaiian people who raised children and hunted in these fertile mountains. Kauai is a world lost in time, it is truly Hawaii's island of discovery. From small towns to jungles and secluded beaches, come find out why they call this the "Garden Island." 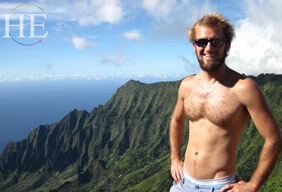 • Hike a portion of the Na Pali coast, widely recognized as one of the most beautiful trails in the world. • Sail past the Na Pali cliffs and snorkel near Niihau, the forbidden island. • Fly through the forest on a thrilling zip-line ride at sunset. • Stroll through a manicured tropical garden with a scandalous gay history. • Hike along the red dirt paths of Waimea Canyon, nicknamed the Grand Canyon of the Pacific. 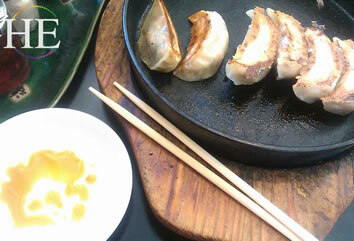 • Dine at wonderful local restaurants: Kauai's chefs take great pride in using locally grown produce wherever possible. • Drive through the magical, misty landscape to a secluded waterfall on an ATV adventure. • Watch the sun rise above the water at our lovely beach-front hotel, where we stay for the entire trip. • Soar over Kauai in an optional helicopter tour above the canyons, cliffs, bays, and waterfalls of the lush "Garden Island". Upon arriving at the airport in Lihue, look for a private transfer to our charming seaside hotel. Plan your arrival with plenty of time to join our fun, lively gay group in the lobby of the hotel at 6:00pm for Mai Tais. We’ll take a short walk into the charming town of Kapa’a for our welcome dinner. Tonight we’ll enjoy an Indian feast while getting acquainted and having an orientation about the week’s action-packed itinerary. We’ll take a shopping excursion together to pick up any last-minute items. Wear good hiking shoes that can get muddy, and put on a swimsuit, because today we’ll do some kayaking, swimming, and hiking to some hidden waterfalls! We’ll have lunch together and then the afternoon at leisure to explore the tiny town of Kapa’a. We may like to pop in for a sampling of concoctions from Hawaii’s only mead-producer. Locally harvested golden honey is made into a liquor ranging from blonde to amber, but always packing a punch! Dinner tonight will be on our own. We’re up before sunrise this morning for a drive to Port Allen, on the south side of the island. Our journey takes us through the changing scenery on the more arid side of the island, with the vast Pacific Ocean to our left. Watch the sunrise light the gradually changing vista. After checking in for our boat ride, we’ll enjoy breakfast together. 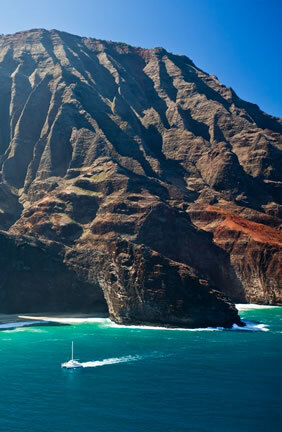 We’ll cruise along the Na Pali coast and glimpse the famed Kalalau Valley, pristine beaches, waterfalls, and sea caves. We’ll stop to snorkel, seeing colorful sealife, and perhaps a pod of joyous dolphins leaping with their family. We’ll cross open water and drop anchor offshore of Niihau (the Forbidden Island), and the crescent shaped Lehua island. Lunch will be served aboard the boat. After returning to port in the early afternoon, we will go for coffee and a tour as we stop at the famous Kauai Coffee Company. We’re on our own for dinner tonight, and we’ll sleep well after a full day of sight-seeing. • head to the hills to put in our earplugs and pick up some rifles. Aim high and low for zooming clay pigeons in a safe, fun competition of aim and skill. We’ll start our day at sunrise with a quick stop at a local cafe for a latte and breakfast to go. We’ll head north past Hanalei to the trailhead of the Kalalau Trail. This hike is easily one of the most famous in the world, because of its beauty as well as the fascinating history of the region. We will hike a portion of the shade-dappled trail today, a few hours to sunny Hanakapi’ai Beach, where we can stretch our legs and have some snacks, before retracing our steps back to Ke’e Beach and the trail’s beginning. We’ll be free to explore the quaint little town of Hanalei, with time for lunch on our own before regrouping and driving back to our hotel. On the way home, we’ll stop for a visit to the Kilauea Lighthouse, and still have time to freshen up before dinner together tonight. Let’s take a few hours off this morning and enjoy island living. Breakfast will be at the hotel. Early risers may enjoy celebrating the sunrise with a hula performance. Some guests may like to rent a bicycle and take a pleasant ride along the paved path that hugs 8 miles of coastline. Just after noon we will depart for the cute historic town of Koloa, where we’ll have a choice of several local food trucks or restaurants to choose from for a casual lunch. Our group will re-convene and head south to tour Allerton Gardens, an exquisitely tended botanical garden with an interesting gay history. Our walk will take a few hours, through exotic tropical foliage, an impressive collection of statues, and among the soothing sounds of water fountains and birdsong. Be sure to also check out the spouting horn and gift shop. Dinner will be at beautiful Allerton Garden and will be followed up by sunset on the beach. Day 7 - Wailua Hike and Sunset Zipline! Enjoy breakfast in our beautiful hotel prior to our departure to Wailua. This morning’s hike will take us to the famous Wailua Waterfall, used in the opening credits of “Fantasy Island”. The 173-foot waterfall feeds into the Wailua River and is one of the most beautiful sites on the island. After the hike we will return to the hotel and journey into the town of Kapa’a for lunch on our own. Tonight we have an early dinner in town together on our way up to the ziplines. 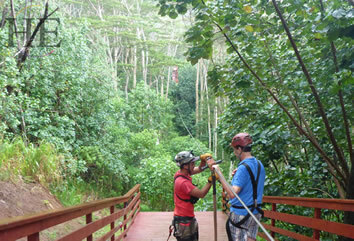 We’ll gear up with harnesses, helmets, and flashlights to fly through the trees on this exciting zipline course. Choose to ride in an upright “seated” position, or in the “superhero” harness, which allows headfirst flight. A perfect way to end our day! This morning we depart early for breakfast and then head out for a visit to Waimea Canyon, a sight so different from the Na Pali Coast that it’s hard to believe you’re still on the same island. A stark contrast to the lush, verdant cliffs of the island’s northeast side, the “Grand Canyon of the Pacific” is all red and ochre rocks and dirt, with patches of greenery and sunbaked earth. We’ll take a hike through this spectacular landscape. Day 9 - Waterfalls with ATV Tour! We encourage a late breakfast/brunch today with additional free time for beach time and shopping. In the late morning we will depart our hotel and head for the hills to Koloa for both lunch at a local restaurant and our final activity of the tour: an ATV tour of Kauai’s back-country! We’ll drive up to a waterfall and take a swim. Heading back to the hotel quickly shower and freshen up, because tonight we’ll have our farewell dinner at a sumptuous beachfront restaurant featuring farm-to-table delicacies and fresh-caught seafood. Thank you so much for traveling with us! Today we’ll say farewell to lovely Kauai. We hope your trip home is safe and comfortable, and that your memories of your Hawaii gay travel adventure are filled with laughter and beauty. • All hotel service charges, government taxes, and porterage; gratuities at included meals. • Gratuities for guides and HE Travel tour director. This tour starts and ends in Kapa'a, Kauai, Hawaii, USA. Travelers should fly into the Lihue Airport (LIH). Most of our trips draw more single travelers than couples. When couples do join us, it's usually because they're looking forward to interacting with a gay group; if they wanted a holiday by themselves, they wouldn't have signed up to travel with us. Furthermore, the activities included with our trips serve as natural ice-breakers. Within a day, you'll be traveling with friends. You don't need to pay the single supplement if you're traveling alone. We'll be happy to match you with a roommate. Pay the single supplement only if you want a bedroom to yourself.